Interview: Errol Morris, Director Of 'The Unknown Known' Errol Morris turns the lens on Donald Rumsfeld in his newest documentary, The Unknown Known. It's similar to Morris' The Fog Of War — except this time, to his disappointment, he doesn't learn much. 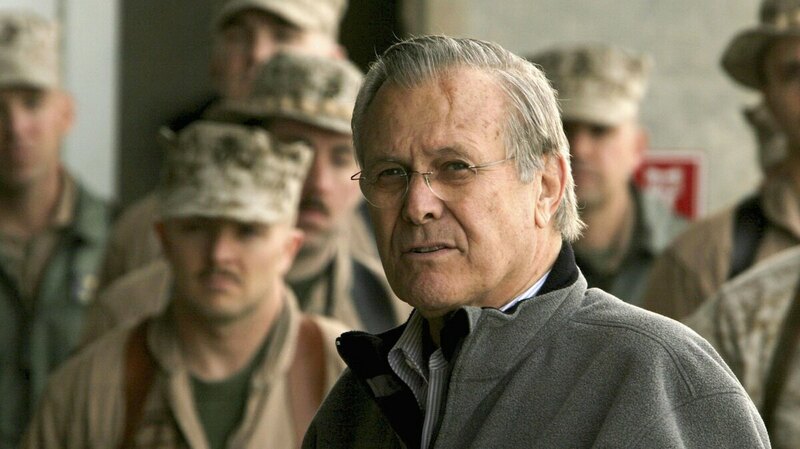 Donald Rumsfeld, shown here on a 2006 visit to Iraq, was the Secretary of Defense during the beginning of the U.S. wars in Iraq and Afghanistan. Errol Morris spent over 30 hours interviewing Rumsfeld for his latest documentary. Filmmaker Errol Morris is famous for trying to get inside other people's minds and understand the motivations behind the choices they've made. In his most famous film, The Fog of War, Morris sat down one-on-one with former Secretary of Defense Robert McNamara to talk about the decisions McNamara made in Vietnam. During the course of the conversation, McNamara makes the stunning admission that some of his actions amounted to war crimes. In his new film The Unknown Known, Morris takes the same approach with Donald Rumsfeld, the Secretary of Defense who oversaw the U.S. war in Iraq. He saw with Rumsfeld for hours and hours of interviews. But this time, his results were different — and much more disappointing. Morris talks to NPR's Rachel Martin about why Rumsfeld, despite being cooperative and sincere, was a frustrating, difficult man to interview. [It was] one of the most difficult interviews I've ever done. Interviews, in my mind, should be investigative — you shouldn't know what you're going to hear going into them, you should be surprised. And I was surprised. But I was surprised by how little I found out, not by how much I found out. 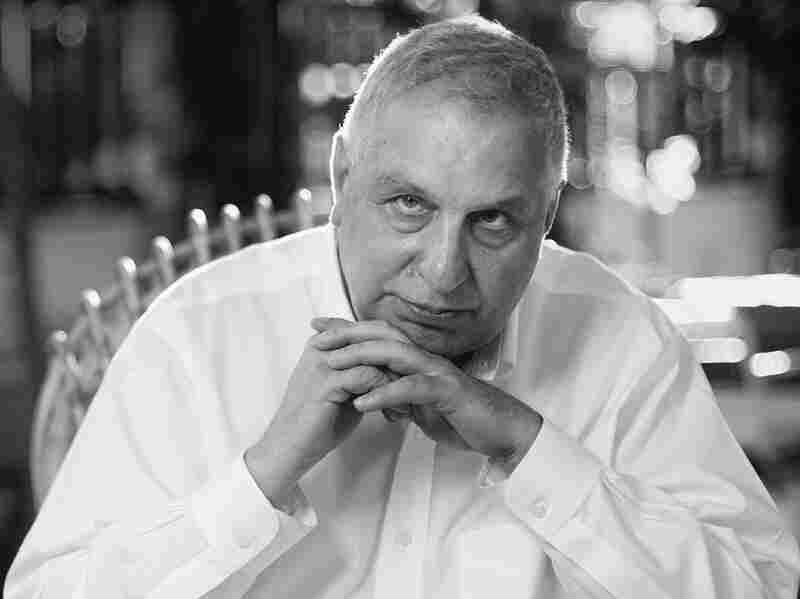 Errol Morris is a documentary filmmaker best known for The Thin Blue Line and The Fog of War. His failure to engage, meaningfully engage, the central issues of our time. I ask him about the war in Vietnam — he was in the Oval Office with President Ford, Henry Kissinger, as we evacuated the U.S. Embassy in Saigon. I ask him, "What did you learn?" His answer: "Some things work out, some things don't, that didn't." I ask him about the torture memos that came out of the Bush Administration: He said he never read them. To me, the most shocking thing about the interview was not his insincerity, but quite the opposite. The fact that he was telling the truth, but the truth was about a failure to really think about anything. I was probably looking for a lot of things that I didn't get. This expression, which he's famous for, "the known known," "the known unknown," "the unknown unknown," et cetera, et cetera, many people have told me, "well, this is really brilliant," and I often ask, "Why"? I don't find it brilliant. In one of the press conferences, indeed, it's the press conference where he first brings out this idea about the "known known" and the "known unknown," he's asked a question by Jim Miklaszewski, the NBC Pentagon correspondent. "What proof, what evidence do you have, that Saddam Hussein is in possession of WMD or is giving them to terrorist organizations?" [Rumsfeld answered:] "There are known knowns, there are things we know we know, and we also know there are known unknowns, that is so say, we know there are some things we do not know. But there are also unknown unknowns, the ones we don't know we don't know." It's a question that he can't answer and won't answer. The "known known" becomes an evasion. I'd hoped that there was more there. I feel a little guilty saying all this. Donald Rumsfeld was cooperative, he came to Boston, where I live. He was charming, he was gracious, he gave me access, for the very first time, to these memos which he had written over the years, and yet, in the end, I think this is the right word: I'm horrified. ... I made Fog of War now 10 years ago. Two Secretaries of Defense, two disastrous wars: Vietnam, Iraq. I could feel in my interviews with McNamara his desperate attempts to understand what he had done, to figure it all out. Here, 10 years later, no attempt whatsoever to figure it out. [Rumsfeld] has this obsession with language, and with words, and definitions — and in the end, the feeling is that we've descended into a sea of words. I told Donald Rumsfeld that I would show him cuts as we went along, and I would encourage him to comment. He had no control over the film, but I was interested in his comments. He wanted me to stress that the policies of the Bush Administration were no different than the Clinton Administration with respect to Iraq. I told him I don't agree. [He] didn't like all of this attention that was given to Abu Ghraib and to torture — to me, one of the blackest marks against the Bush Administration. And yes, it's an important part of the film, and yes, it should be.